Home News SoHo of the Midwest? I wasn’t able to attend the recent Cincy bloggers tour of the Gateway Quarter, but I’ve got some thoughts on the things happening in OTR nonetheless. 3CDC is making tremendous progress on its projects, and there are a stream of other investments that are complimenting these investments by 3CDC (see Washington Park, SCPA, Cincinnati Arts Academy, Main Street businesses, etc). When you then think about the even greater potential, for private investment, that will be made possible by the Cincinnati Streetcar…it could really make you weak in the knees. I understand the issue of gentrification and/or displacement and it is certainly an issue that will have to be addressed as these efforts continue, but right now there is PLENTY of room for everyone to coexist. I look at OTR and see that often talked about potential for Cincinnati. This is a neighborhood/built environment that VERY few cities can match…anywhere! When I see the things going on in the Gateway Quarter I can’t help but think of OTR becoming the SoHo of the Midwest. This is an opportunity for Cincinnati to be a major draw for YPs, the creative class, and new businesses. If ever the opportunity has existed…it is now. Cincinnati stand strong, this is your time! So what do think should become of OTR? Do you see the SoHo that I see…or something else, please share your thoughts. 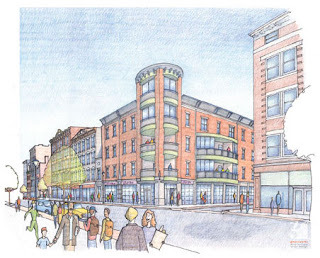 The rendering is of the proposed new infill (by 3CDC) called Trinity Flats on Vine Street. You can see images of the structures that were taken down HERE.